So what’s the story with Black Eyed Peas supposedly bringing good luck to all who eat them in the New Year anyways? I guess Black Eyed Peas are a Southern thing. This southern California girl had never actually (knowingly) tasted a black eyed pea before dinner last night, and I quite liked them. 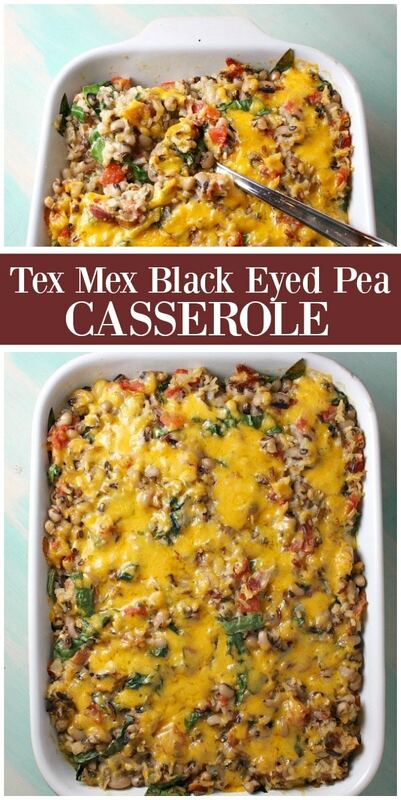 I put them in a Tex Mex Black Eyed Pea Casserole. It’s one last hurrah of a comfort-food dish before the New Year begins. And it’s family- friendly too. There they are in all their glory. 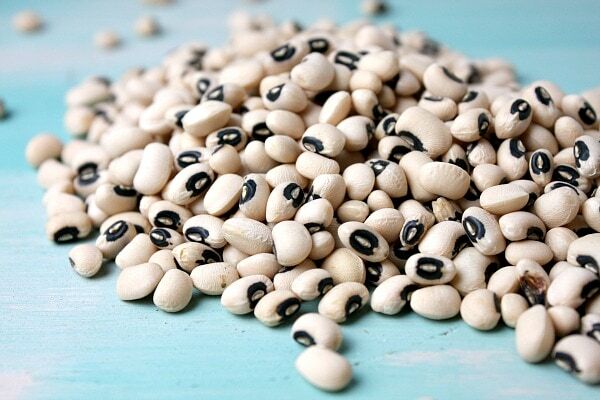 Black Eyed Peas. They’re purdy little things, aren’t they? I suppose you could speed things up and use canned black eyed peas for this dish, but then it probably wouldn’t be quite as good now, would it? 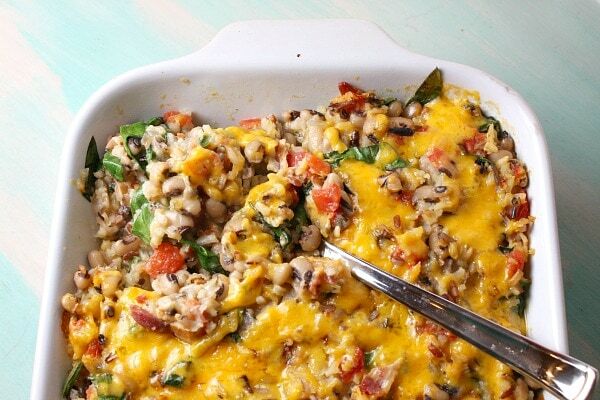 Why should you eat Black Eyed Peas on New Year’s Day? 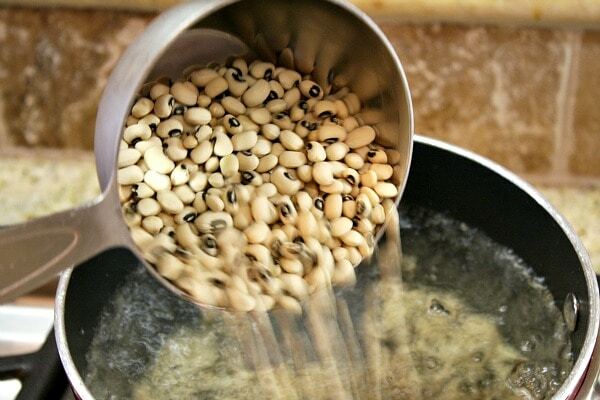 It started in the south, but eating black eyed peas on New Year’s Day is thought to bring prosperity in the New Year. Dried black eyed peas swell when they cook (symbolizing prosperity), the spinach greens in the dish symbolize money, and the pork (bacon) in the dish symbolizes positive motion– because pigs root forward when they’re foraging. 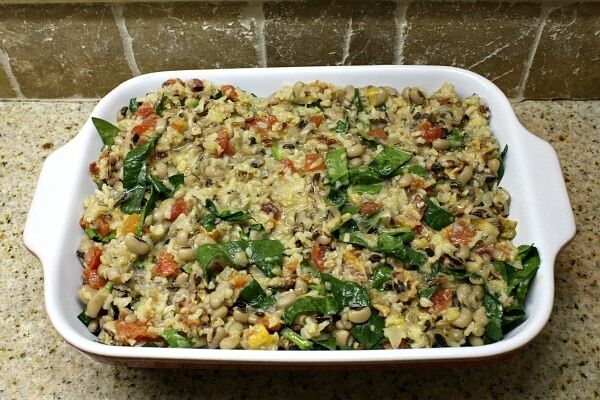 It’s a tradition to eat something with black eyed peas on New Year’s Day! I read a lot about black eyed peas and how to prepare black eyed peas before I attempted this dish. Some folks soak them overnight. Some slow cook them. I went with the crowd that said that soaking wasn’t needed. I rinsed them, and then I boiled them for about 30 minutes. That gave me a tender black eyed pea, which is what I was hoping for in this recipe. Easy “pea”sy. This is the 3rd thing you’re going to do: prep the rice. In fact, you’re doing all three of these things at once. The peas are boiling, the bacon is in the oven and the rice is simmering. It sounds like a lot, but it’s not. It’s all going at the same time. Onions and garlic are sautéed in a little olive oil, then add the rice, then broth, then simmer until the rice has (almost) absorbed the liquid. It’s best if you use a sort of rice that takes about 20 minutes to cook. If you want to use a rice with a longer cooking time, you’re going to have to account for that and adjust as needed. Then dump the almost-done rice in a bowl. 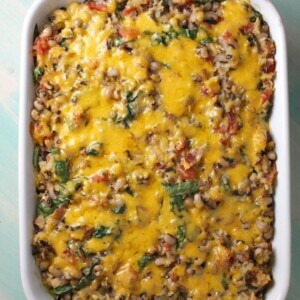 Add tender- cooked black-eyed peas, a can of Ro-tel tomatoes, fresh spinach, BACON and cheese. Mix it up. 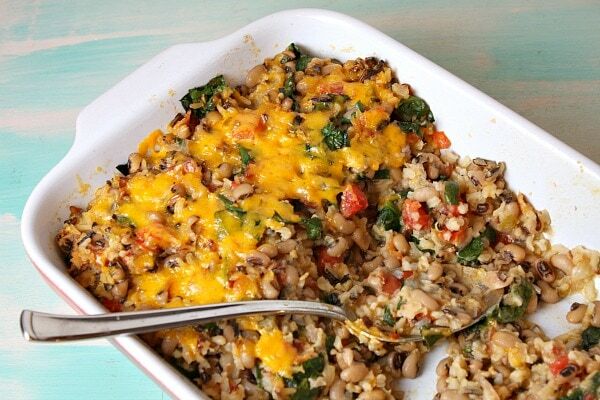 Spread it into a casserole dish and bake for 20 minutes. Add some more cheese on top and bake for 10 more minutes. There’s good ‘ol down-home comfort right there. Add a little sour cream, cilantro and sliced avocado, and your dish is complete! Oh, and about those black-eyed peas… tradition says that the peas brings prosperity to those who eat them on New Year’s Day. I guess it’s worth a shot, right? 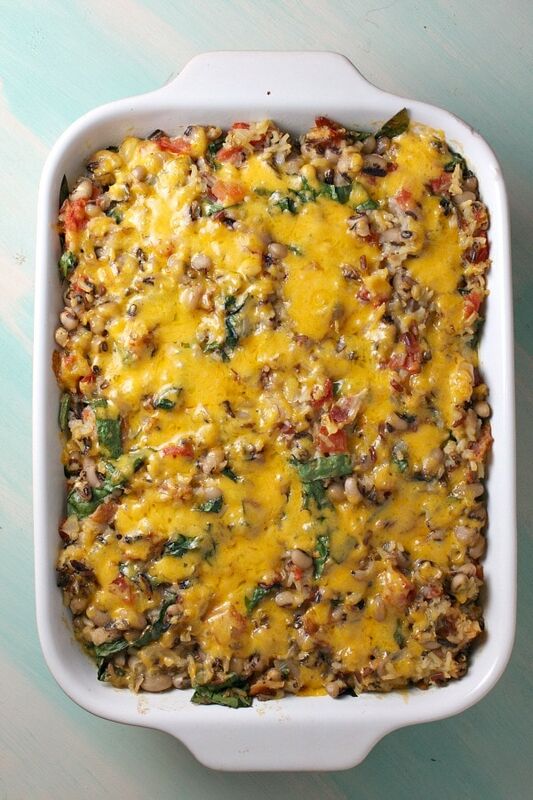 Another recipe to make with black eyed peas is my Cheesy Black Eyed Pea Dip. 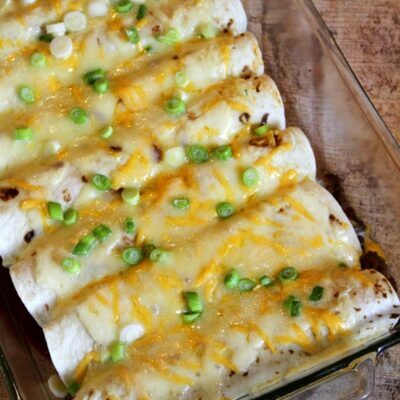 It’s been a big time favorite to serve on New Year’s Day while watching football games! 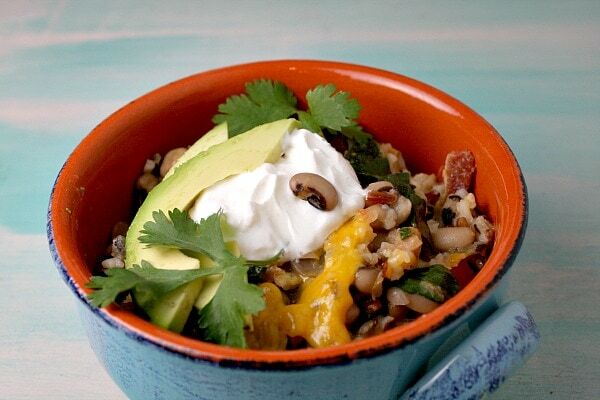 A very popular black eyed pea recipe to serve on New Year's Day for good luck! Bring a medium pot of water to boil. Add the dried peas and boil for 30 minutes, or until tender (as tender as a canned bean would be). You don't want them to have much of a bite to them, but you don't want them mushy either. Drain the beans when you've got them where you want them. In a deep medium skillet, heat the olive oil at medium heat. Add the onions and cook until softened, 3 to 4 minutes. Stir in the garlic, then rice, broth, cumin, salt and pepper. Bring to a boil, cover and cook for about 20 minutes (just until the rice has *almost* absorbed all of the liquid). Time will vary depending on the type of rice you choose to use. 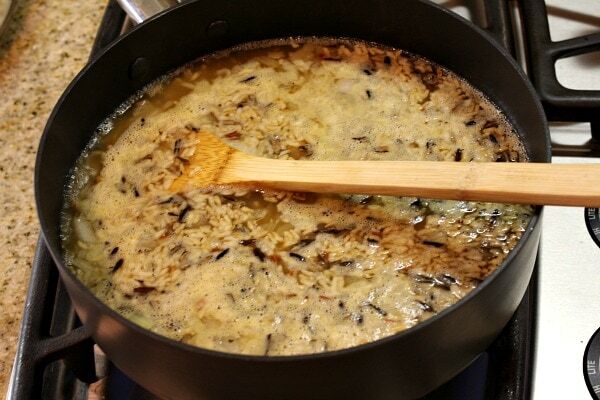 Preheat the oven to 350 degrees F. Scrape the rice into a large bowl. Add the peas, tomatoes, spinach, 1 cup of the cheese and bacon. 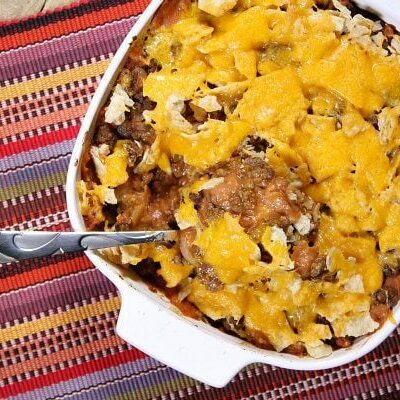 Stir it all together and then scoop it into a 9x12-inch (or similarly sized) casserole dish. Bake, uncovered, for 20 minutes. Sprinkle remaining cheese on top and bake for an additional 10 minutes, just until the cheese is melted. 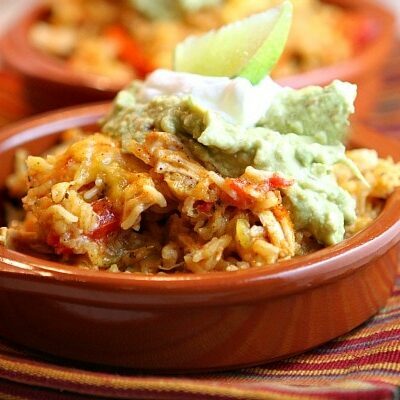 Serve in bowls topped with sour cream, fresh cilantro and sliced avocado (if desired). *To convert to VEGAN: don't use bacon, use veggie broth instead of chicken broth, and Daiya shreds instead of cheddar. Add some chipotle chili pepper to add back some smokiness that the bacon would have provided (as well as a bit of a spicy kick). *To convert to VEGETARIAN: don't use bacon, and use vegetable broth. *Nutritional information does not include the optional toppings. *If you are preparing this recipe as gluten free, just be sure to use brands of bacon and broth that are known to be GF. *Quick and Easy tips: You can certainly try substituting canned black eyed peas for the boiled dried beans in this recipe, and you can purchase the already cooked bacon too. *If you'd like to oven-fry your bacon-- it's so easy! Line a rimmed pan with foil. 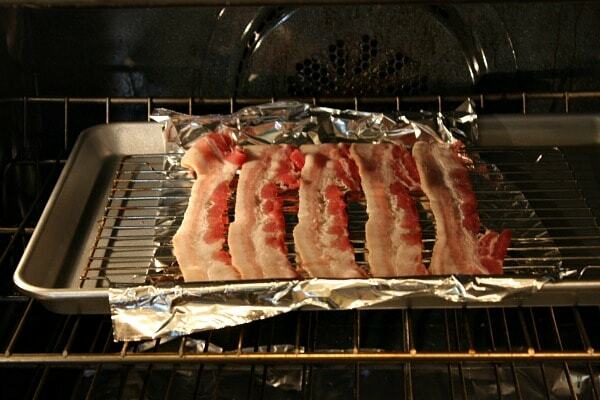 Lay your bacon strips on the foil. Place the bacon in a preheated 400 degree F. oven for 15 to 20 minutes, or until crisp (time will vary based on thickness of the bacon). Dab the bacon with paper towels to soak up any excess grease, and it's easy clean up too! Hi Mary, yes… just added as uncooked rice. If I had expected you to cook it before adding it, I would list it as “cooked rice” in the ingredients. It just has to be a rice that can cook in 20 minutes, since that’s the time the mixture cooks on the stove. 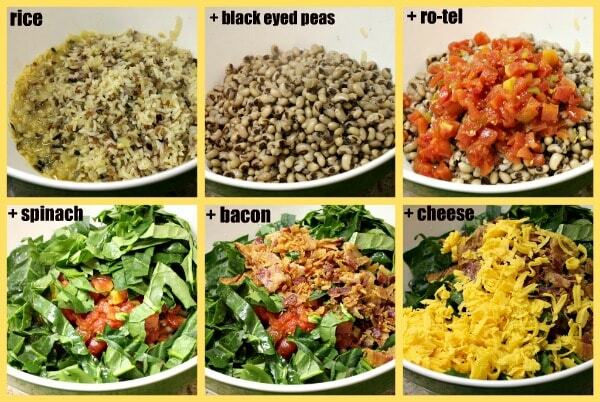 Thanks to RACHEL R. for the vegan conversion ideas!! Going to make this today. Hi what kind of rice did you use? Looks so good! You can use any kind of rice. If you use anything other than white, the cooking time will be a bit longer. This was wonderful. The only change I made was to add 1/2 pound of hot turkey italian sausage, the kind that comes out of the casings. I followed the rest of the recipe to a Tee. My husband, who hates black eyed peas, had two helpings and told me he’d have it again. WooHoo! I made this with ground beef instead of bacon and it was great as a main dish. Next time I’ll use 2 cans of regular tomatoes. This is a terrific recipe – and for those that are interested, very easy to veganize! My husband and I are vegan, so I made without the bacon, used veggie broth instead of chicken broth, and Daiya shreds instead of cheddar. I added some chipotle chili pepper to add back some smokiness that the bacon would have provided (as well as a bit of a spicy kick!). Absolutely delicious! This is a great recipe. I used brown rice and I added an additional 20 minutes to the 20 minutes suggested in the recipe. The brown rice burned to the bottom even thought it soaked up all th rest and it was underdone when I combined it (in the next step) with th tomatoes, spinach, cheese and bacon. I highly suggest anyone who uses brown rice for this recipe to cook it 90% through prior to adding it to the onion and garlic. It’s a lot better when it’s a little overdone and soft versus it being chewy and underdone once it’s baked- like what happened to me. And if yours brown rice turns out underdone even after you bake it, add leftover vegetable or chicken broth to the casserole dish, COVER it & then bake it at 350 degrees for an additional 20 minutes. This will slightly decrease the chewiness of the final product. we make this every year. It is our new tradition. Thanks for sharing. I enjoyed this again this year. I don’t use the spinach…I use cilantro. And, I love it. Made this for lunch today to increase our fibre intake – I chose to soak the beans as I couldn’t find canned and they were marvellously creamy. Incredibly filling recipe too. I included the bacon, but would probably eliminate it next time around. This has become my favorite recipe!! I’ve made it with both white and brown rice, I used bacon bits instead of cooking my own bacon, and this last time I added some sliced sausage (like in red beans and rice) and it is just awesome! With the brown rice it’s a super healthy dish – love all the veggies my family gets from this recipe! Love it!! Thanks for sharing! !